Crate training is a very polarizing issue, some people believe it's the best thing for the entire family, including the dog. Others believe that crating your dog is cruel and ineffective. There are absolutely instances where it is done improperly and becomes inhumane, but when done correctly it is an amazing tool, providing your dog with a safe environment that he or she will come to love. Crate training, when done correctly, is not only humane but can even be enjoyable for your dog. One of the top mistakes people make is putting the dog in the crate just to get it out of their way, the crate is not meant for that. The crate is not designed for leaving the dog all day long and only giving it attention when it is convenient for you. The crate should absolutely be used for those times when you can not watch your puppy, but care should be taken not to use it too much. With correct use, you will find there are many benefits to crate training. Top of the list, of course, is potty training. You can effectively teach a puppy not to use the house as its bathroom by using crate training judiciously. Utilizing the crate will also prevent your dog from getting into trouble when you are away, either by destroying things that will leave their families unhappy or getting into things that could harm or even kill them. It also directly benefits your dog by giving him his very own safe place to go to for comfort. Dogs are descendants of wolves and, like wolves, are "den" animals. The den makes them feel safe, confident, secure and comfortable. Proper use of the crate creates that "den" for them and they will actually be happy to go to it when sent there. It also creates a place your dog knows he can go to for safety when he is uncomfortable or scared. Properly done, crate training will teach your dog that the crate is also his safe zone and when frightened or upset, your dog will go to it for comfort. Crate training can also establish important boundaries for your dog. You should never use a crate to "punish" your dog for bad behavior, but you can show a dog what its boundaries are, to promote good behavior. Crating your dog when you are not home teaches them where they belong anytime you leave the house. 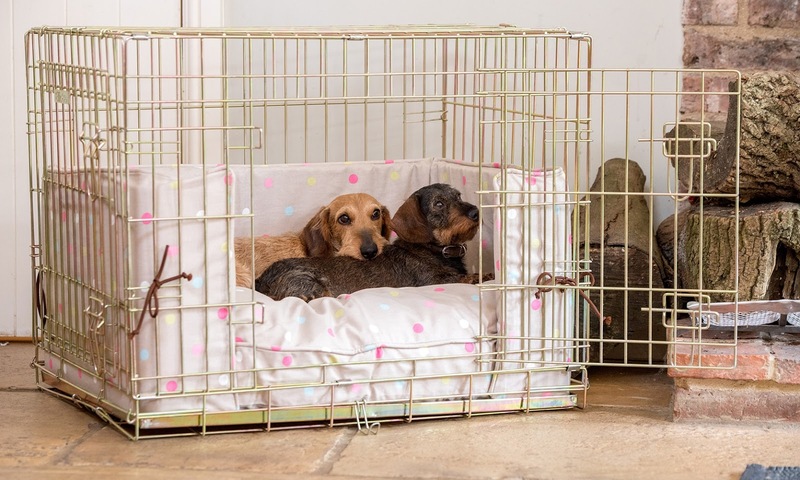 They will become so comfortable with the crate and the known expectation, that they may even go to it on their own when you are away, and stay in it on their own even if the door is not locked. The community of dog owners remains divided on whether or not crate training is a good thing; however, the facts show that when used correctly, crate training can be very effective and humane. Your guiding points should be: 1) purchase the best quality crate possible, 2) it should be neither too large nor too small, and 3) never overuse the crate inappropriately. You'll find that when you use crate training only when appropriate and necessary, the result will be a well-trained puppy or dog with a happy owner!